Shmoop's unique, teen-friendly, end-of-course assessment prep gets students where they need to be so that they can graduate on time—and with Texas-style confidence. Shmoop is dedicated to raising student achievement and engagement across the country. That means providing Texas-specific test prep so that Texas students have everything they need right at their fingertips. Texas never takes the easy way out, especially when it comes to education. In Texas, high school students are required to take end-of-course (EOC) assessments in ELA, math, science, and social studies. And Shmoop (http://www.shmoop.com), a digital publisher known for its award-winning test prep and online courses, is just as much of an overachiever, offering a unique, teen-friendly guide to each and every one of the exams. Shmoop has recently updated its Algebra I, Algebra II, U.S. History, Biology, English I, and English II guides to meet the state's updated criteria, which means that studying in the Lone Star State never has to be boring again. Included in the prep is a comprehensive review of each topic, hundreds of drills with accompanying instructional videos, and multiple auto-graded practice exams that mirror the actual test. The icing on the Texas donut? Shmoop's prep has had proven results. Hey, if everything is bigger in Texas, then scores might as well be, too. "Shmoop is dedicated to raising student achievement and engagement across the country," says Ellen Siminoff, president and CEO of Shmoop. "That means providing Texas-specific test prep so that Texas students have everything they need right at their fingertips." In case the EOC prep wasn't enough to knock Texas's boots off, Shmoop also offers a suite of courses aligned to the Texas Essential Knowledge and Skills (TEKS), an entire section devoted to the TEKS themselves, and a guide to the Texas Success Initiative (TSI) exam. So go big, go home, or go to Shmoop's Texas page. 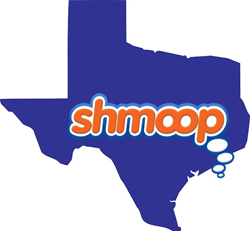 Individual Texans can subscribe to Shmoop for a low monthly rate, while schools and districts can get bulk discounts by contacting sales(at)shmoop(dot)com. Shmoop offers hundreds of thousands of pages of original content. Their Online Courses, Test Prep, Teaching Guides, Learning Guides, and interactive Study Tools are written by teachers and experts and balance a teen-friendly, approachable style with academically rigorous concepts. Shmoop sees 13 million unique visitors a month across desktop and mobile. The company has won numerous awards from EdTech Digest, Tech & Learning, and the Association of Educational Publishers. Launched in 2008, Shmoop makes the magic happen from a labradoodle-patrolled office in Mountain View, California.